It seems that Galanthophiles are out in force just now wallowing about in the cold wet dubs* looking at wee green marks. Once again I make the appeal for an uprising of the Leuco-Jocks, stand up for Leucojums, start looking for minute variations and see what we can find !! 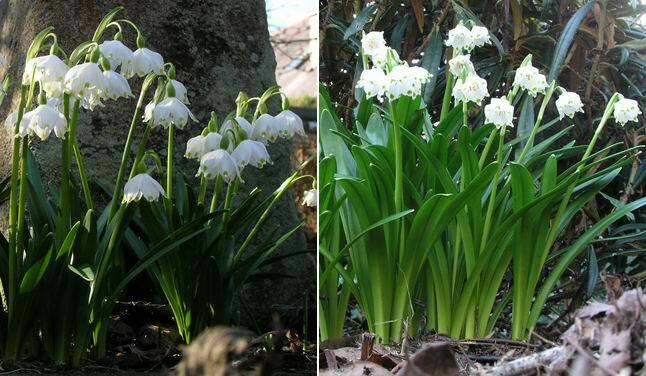 Above left is Leucojum vernum var carpaticum 'Podpolozje'. Originally collected near the village of Podpolozje in the eastern Carpathians, it bears twin flowers with greenish yellow tips. I find that the yellow on the tips of var carpaticum varies depending on growing conditions and exposure to light - the more exposed the plant the more yellow the tips, you can even find that the tips on the sunny side of a flower can be yellow while those on the opposite side are greener. On the right is L. vernum var vagneri which is a robust usually twin flowered form with quite broad leaves. 'Lyn's Pink' is a lovely colour selection of C tommasinianus that I got from Lyn Byzzant it is the most striking colour form that I have seen from this variable species. 'Tommies' often get a bad name for being a weedy species that can become a problem - I have never found that in our garden and I think there are some super forms around. I make no apology for this Crocus dominated log it is just the way it is in the bulb-houses just now, where they are the stars of the moment on a sunny day, not just for their looks, many also have a delightful scent. Two forms of C alatavicus that we grow, the one on the right is quite prolific multiplying well by offsets but I prefer the left hand form with its much larger more impressive flowers. I have of course been transferring the pollen between these two forms in an attempt to get offspring that will combine the best features of the two forms - the prolific form came from Janis Ruksans which leads nicely into the next crocus. C. reticulatus x angustifolius 'J.R.'. 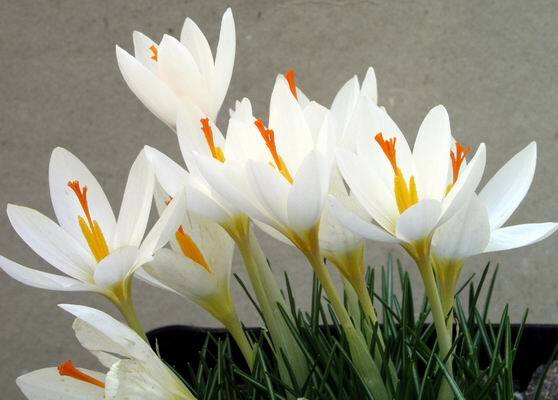 This lovely cross between reticulatus and angustifolius has been named after Janis and it is a wonderful crocus that increases well and produces up to five flowers from a single corm. One of the best of the white crocus you can grow is C. malyi which is equally happy in a pot or a sunny well drained spot in the garden. 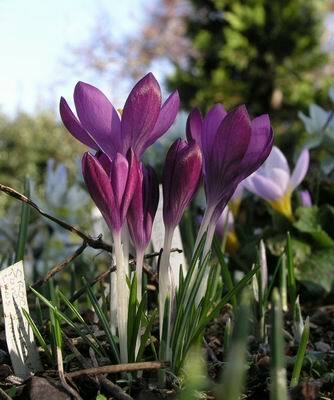 I should say that most of the Crocus that I am showing will grow well (if not better) in the garden. 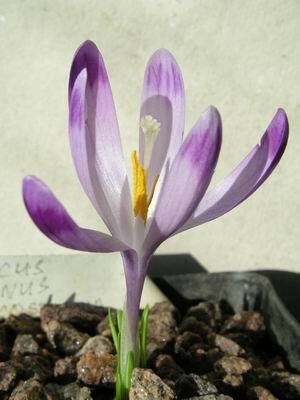 It is often the rarity ( which equates to price) of a crocus that makes us frightened to try it in the garden. In my early growing years I have nearly lost some of the crocus in pots and when the corm got so small I often as a last resort (or had I given up hope) put it into the garden and that is how I saved many a total loss from occurring as most of them then thrived under their own management. This also bought me time to learn how to grow them in pots. 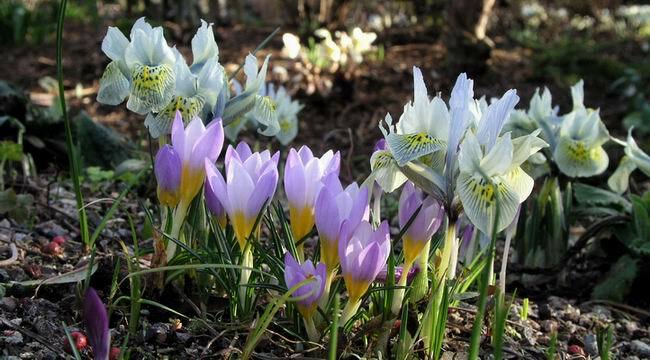 Crocus paschei and versicolour enjoying the mild sunshine. 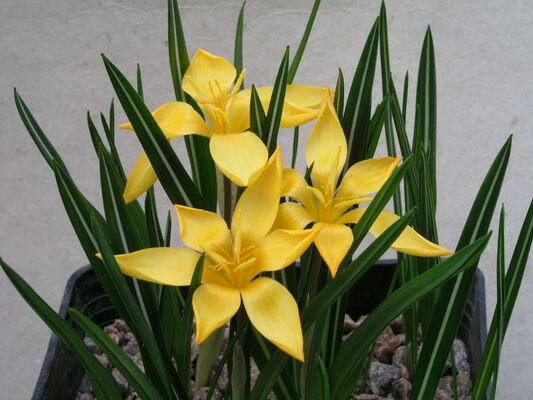 C olivieri has one of those lovely shiny yellow flowers that are like miniature suns shinning up at you. On the left is C olivieri ssp olivieri and on the right is C olivieri balansae which I like so much I am showing you another picture of it. I think it has quite an unusual shape for a crocus flower. C. vernus is another very variable species and this is the form leucostigma which has a white stigma. There are so many superb forms of C. sieberi it is hard to pick out an all-time favourite, I think for beauty I would go for C. sieberi sieberi (log 6) but for the combination of beauty and availability then it is very hard to beat C. sieberi 'Hubert Edelsten'. C. sieberi atticus is one of the very best growers in our garden it increases steadily where ever we plant it, I will leave you this week with a picture of it taken in the warm sunshine of the other day - it is snowing and freezing again as I write this log such is the Scottish climate. C. sieberi atticus & I. 'Kathrine Hodgkin'.